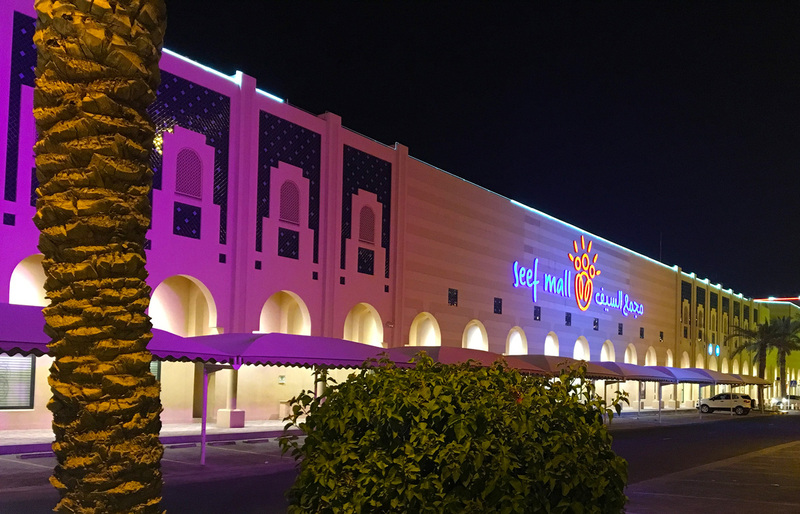 Seef Mall was Bahrain’s first mega-mall – opening in 1997 and quickly becoming the go-to place for locals and expats who were keen to experience the variety of international stores the mall had the pleasure of enticing to make their debuts in the country. Today, it still remains one of the most family-friendly shopping and entertainment destinations in the Kingdom of Bahrain. Ideally located in the Seef district, the mall expresses itself with distinctive architecture and bright open spaces, inviting visitors to explore all that is on offer in the 135,000 sqm venue. The mall caters for every need, with a classic selection of stores ranging from budget to high end, including 2 food courts incorporating numerous restaurants and cafe’s, health & beauty stores and 2 separate cinemas – because one cinema is just not enough. Working closely with one of our partners in the region – Elames Lighting BSC in Bahrain, Pulsar was selected to supply external lighting to illuminate the façade of Seef Mall. The large façade of the building provides the perfect canvas to demonstrate the capabilities of the latest Pulsar fixtures. The fixture layout and design was completed by the internal lighting design service provided by the Elames Lighting BSC team, who wanted to create an even, reliable light across the building. Having selected the Luxeos18 from our new flagship Luxeos Range, a 40 degree beam angle for maximum uniformity was chosen. The design involved careful spacing out the units around the façade, taking into consideration the restrictions caused by roads, trees and existing civil infrastructure. The Luxeos18 was chosen based on it’s ability to generate a fabulous array of colours with ultra-smooth dimming and a control system second to none. The Luxeos18 fixture, incorporating the latest Quad core LED technology is a worthy successor to the world-class ChromaFlood200’s, which were previously installed. Pulsar’s rich history of building long-lasting, durable and reliable lighting products – showcased in Bahrain since 2007 – was a key factor in the decision making process, having demonstrated over a number of years our ability to withstand the high heat, salt water, humidity & dusty conditions the Bahrain atmosphere delivers. The lighting installation is controlled by a Pharos TPC control system, providing timed events, remote access, easy configuration of the fixtures via RDM and a very easy user interface for temporary, on-the-fly or pre-programmed lighting events.